When it comes to the furniture in your office, there are some pieces that are more important than others. One of the most important pieces of office furniture to have is an office desk. Your desk is where you will spend most of your day and where you will conduct most of your work. 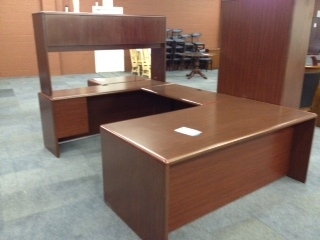 Because your office desk is so important to your job, you shouldn’t just pick up the first desk that you find. How much space is in my office? What type of business will I be conducting? Will I have one computer monitor or two? Will my computer be the only item on my desk? Once you have answered these questions, you are able to form a better idea of what type of desk you will need. Choose a desk that will comfortably fit within your space without making the area too crowded. You must also be able to fit behind the desk with your chair. If you will need space, choose a desk that has a wide surface area, or one that features small shelves or drawers. If you are afraid of spills or other damage taking place, choose a darker shade of wood that features a protective stain or finish. This entry was posted on Friday, October 24th, 2014 at 4:41 pm. Both comments and pings are currently closed.